Pune: An engaging tie between FC Pune City and ATK ended 2-2 but play-off hopes for either side took a beating in the Hero Indian Super League here on Sunday. 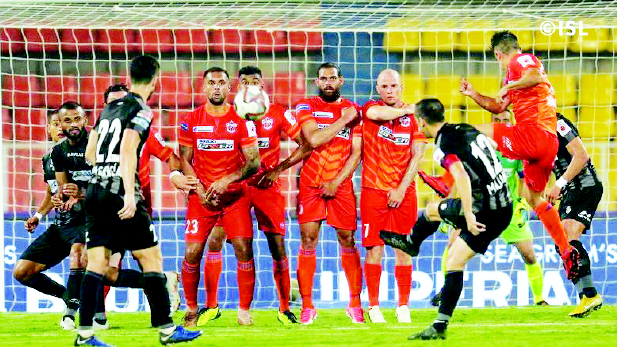 Pune took the lead in a see-saw tussle through Marko Stankovic’s deflected strike (17′). A superb goal from Jayesh Rane (23′) and a penalty by Edu Garcia (61′) looked to have turned the tables in ATK’s favour but Robin Singh scored a header (73′) to help Pune clinch a point. ATK have lost the chance to move within a point of fourth-placed North East United FC and stay sixth with 21 points from 15 matches while Pune City’s slim hopes of reaching the top-four have ended. Just at the hour mark, Diego Carlos was adjudged to have handled the ball when going for a 50-50 ball with Everton. The resulting spot-kick was buried into the net by Garcia, who scored his second in three games to put his team 2-1 ahead. ATK were handed a setback soon after when Pronay Halder suffered an injury and had to be taken off for Eugeneson Lyngdoh. Steve Coppell’s side were dealt another body blow in the 76th minute when Robin Singh headed in a corner from Marcelinho to pull Pune level.